In October, Deputy Adam Stoddard was caught on surveillance video removing a paper from a defense attorney’s file. Judge Gary Donahoe held Stoddard in contempt of court for the action and ordered him to apologize or go to jail. Stoddard held a press conference Monday night, but instead of apologizing Stoddard said he did nothing wrong. Come on Deputy Adam Stoddard, what you did was wrong taking a document from the courts without first asking. Now that you’ve been cuaght it’s easy to claim it’s your job but that’s not what America saw on Video as you peered over your shoulder (as if you did not want to appear as you were reading) and then tried to cover up your violation. The fact you’re not man enough to fess up to your wrong tells America the true story. You’re not about justice, you’re a fraud in a fancy uniform with a tin badge you hide behind. 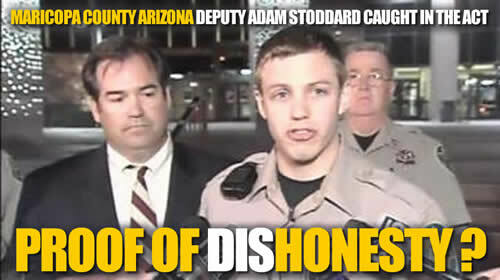 Shame on you Deputy Adam Stoddard you make all law enforcement look dishonest. Maricopa Superior Court Judge Gary Donahoe ruled Nov. 18 that Deputy Adam Stoddard acted in contempt when he pulled two pieces of handwritten paper out of attorney Joanne Cuccia’s file on Oct. 19. “I am Maricopa County Detention Officer Adam Stoddard. I work in the Court Security Division of the Sheriff’s Office and have been with the Sheriff’s Office for five years. Recently, Superior Court Judge Gary Donahoe ordered me to hold a press conference to publicly apologize for doing the job I have been trained to do. Officer Adam Stoddard testified that he saw four words — “going to,” ‘’steal” and “money” — in a document sticking out of the file that led him to believe Cuccia’s client posed some sort of security threat. However we are in a court of law with the victim handcuffed so there WAS NO THREAT OF ANY KIND Officer Adam Stoddard. Why did you not say “There is a Threat your honor when it happened? Why did it take so long to make up this story? Officer Adam Stoddard’s lawyer, Deputy County Attorney Tom Liddy, wouldn’t tell the Phoenix New Times whether the officer Adam Stoddard was in a jail cell, saying authorities were not releasing “conditions of confinement” as a security precaution. Liddy did say that Officer Adam Stoddard wasn’t being forced to wear pink underwear or use pink towels like other county inmates. The judge who ordered Liddy to jail, Gary Donahoe, said Thursday that he couldn’t comment on the case, KTAR.comreports. His refusal to talk comes as the conflict between Donahoe and the sheriff’s department continues to worsen. Deputy Who Took PD’s Document Is in Jail, But Is He in a Cell? STODDARD v. Antonio Lozano, Real Party in Interest.